Sinusitis is the condition that refers to inflammation and infection of the sinuses. The sinuses are air pockets in the facial skeleton that communicate with the nose. The sinuses normally produce mucus that drains through specific drainage pathways into the nose. Therefore any nasal condition that results in increased mucus production or congestion can potentially block these drainage pathways and result in sinus infection. Such conditions include viral upper respiratory infections and uncontrolled allergies. The symptoms of sinusitis include facial pain, headaches, pain in the upper teeth, nasal congestion, postnasal drip and production of thick yellow/green mucus. Treatment typically requires antibiotics as well as nasal decongestants and nasal saline irrigation. Patients who suffer from frequent sinus infections or infections that never completely resolve (chronic sinusitis) are advised to obtain a CT scan of the sinuses. This scan can help identify any anatomic problems which predispose these patients to infection and which can be corrected with sinus surgery. Did you know...sinus problems affect an estimated 30 to 35 million American's - making them one of the most common complaints of patients seeking medical attention? 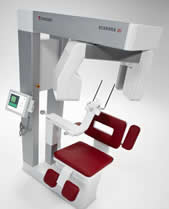 Metro ENT is happy to announce the addition of our own In office CAT scans, the Soredex Scanora 3DX offers a variety of advantages over traditional scanning. The sinuses, ears, facial bones, and Temporomandibular Joints TMJ's can be displayed clearly and in various views which allow us to scan, diagnose, and treat within a single visit.